A 1-0 win for East Fife at Stark's Park in 1988 heaped more misery on the Kirkcaldy side. You have to trawl through a now very dusty archive to find a report from the last time East Fife had derby bragging rights over Raith. 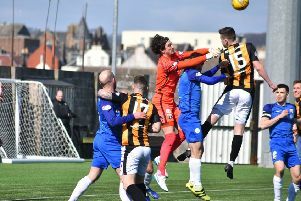 That time lapse in itself may partly explain the outburst of emotion and ecstatic scenes which met the full-time whistle at Bayview on Saturday as East Fife clocked up a dramatic victory. East Fife recorded a 1-0 win at Stark's Park in April of 1988. The Fife Free Press report from 1988 described East Fife as 'purposeful' and 'displaying an urgency' on their way to a 1-0 win. The same could be said about the Methil men at the weekend.